You have just bought yourself the latest iPhone and looking for a case, for securing it from scratches. How about getting something, that would carry your charger along. An innovation from Kickstarter could put an end to the trouble of having to carry a separate charger for your phone. Jonathan Globerson the leading product designer and CEO of GloberDesign is an active partner in Rivo Case LLC. The company which has invented Rivo Case. Even if, you are stuck in your car with your bag in the boot, or if that endless meeting is shrinking your phone’s battery every minute, nothing can stop you from charging up your mobile phone. Just connect the charger to any USB device such as car, computer, television or any other device and you could easily have your phone charged! You are using your phone all the time, and it runs out of battery often. However, stocking up on battery, even on the move was never so easy! Designed with the latest engineering software, the Rivo, is an integrated case with charging, syncing and data transfer cable that allows charging with the case on. Therefore, each time you connect your device for charging, you can simultaneously transfer all your data such as photos and documents to and from the device connected. Multi featured cases are often intensely odd shaped and bulky with their detachable parts often becoming loose with regular use. 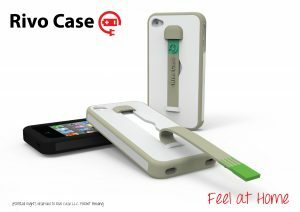 With a thickness of just 2mm, the Rivo case has softened edges that make it comfortable and handy. 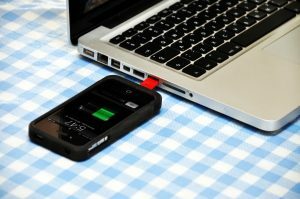 The charging USB plugin has been given at the backside of the case, which is covered with flexible silicon, making it smooth, and easy access to flip open. The Rivo case has a hard frame made from ABS plastic and Thermoplastic Polyurethane or TPU that makes it truly sturdy and protects it from wear and tear. Manufactured through plastic injection molding technique, the plastic beads, are initially heated to a temperature of several thousand degrees, which melt them. The molten plastic is then cast in molds and cooled off to create a case, which are then inspected for quality. The case has been fully prototyped, and Kickstarter is all set to begin production. An initial pending patent and funding is all that keeps the Rivo from hitting the markets and the creators. 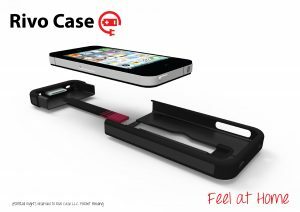 The Rivo case is currently available in 3 color variants for the iPhone4 and in two colors of black and red for the iPhone5. If all goes well, Rivo is expected to enter the market by March 2013 after funding and patent clearances.